A man from Felixstowe who fatally stabbed his wife repeatedly has been given a 17-year sentence. Home buyers looking for properties with a view of the sea can expect to pay a typical £68,000 premium, according to new research. Homes in seaside towns which boast a sea view have a price tag which is £68,632 or 29% higher on average than properties in seaside towns where home owners cannot see the waves from their windows, according to Rightmove. The analysis looked at all properties for sale under £1 million in seaside towns across mainland Britain, and found that the average asking price for a sea view is £304,702, compared with £236,070 for a home without one. Five lorries were shot at with what police suspect is an air weapon. The port is using trains to reduce road congestion. Credit: ITV Anglia. The Port of Felixstowe has become the first in the country to transport a million containers by rail in a year. Bosses say the milestone highlights how they are using trains to reduce the environmental impact of transport and reduce road congestion. This new milestone for the port reflects the dedication of our workforce and the excellent relationships we have developed with all the rail freight operators at the port. Rail is an increasingly important differentiator for shipping lines as well as importers and exporters and we are able to offer them a greater number of rail services to more destinations, more often, than any other port. Rail is also a key factor in reducing the environmental impact of transport and helps reduce road congestion. Police are appealing for the owner of a black Labrador to come forward after a man was bitten in an incident near Felixstowe last week. The man was walking another dog along a footpath between Hemley and Newbourne at approximately 11:45am on Saturday, 21 October, when the Labrador ran up to him and bit him on the leg. The dog was not on a lead and the victim reported that he had to kick it in order for the animal to release him. The owner is said to have then grabbed the dog, but refused to give his details. The owner is described as a man in his 60s, approximately 5ft 9ins and of average build. He was also walking a smaller, golden dog which was also of Labrador appearance. Anyone with information about this incident, or who believes they may know the owner of the dog, is asked to contact Suffolk Police on 101 quoting CAD 270 of 21 October. A man from Felixstowe who carried out a 'disturbing catalogue of sexual abuse' on young girls has been jailed for 15 years. 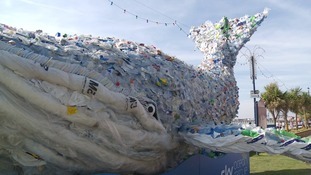 A 10-metre long plastic whale has gone on display in Felixstowe in an attempt to highlight the growing problem of pollution in the ocean. When you think of English seaside resorts what comes to mind? Fish and chips? Sandcastles? A dip in the sea? Well, how about beach huts? Since the Victorian times the East Anglian coastline has been known for it's colourful wooden huts - somewhere to head for a cuppa on a nippy day, or a place to store the towels and crabbing buckets! But one very special hut, owned by Joy Reeve has now been crowned 'Beach Hut of the Year'. Joy uses her hut to raise money for charity by providing welcome hot drinks, especially to those brave enough to dip more than a toe in the water. TV presenter Phil Spencer, presented Joy with her award, and told ITV News Anglia 'Grandma's Little Hut' is central to the community on the beach at Felixstowe. A 46-year-old woman who died after being found on the floor at her home in Felixstowe has been named as Diana Last. Police were called to Leeward Court following concerns for a woman who felt 'very unwell' and had been admitted to Ipswich hospital. Officers began an investigation and arrested a 58-year-old man from Felixstowe. He's since been released under investigation while further enquiries are carried out. Following a post mortem examination, her cause of death is undetermined and further tests will be carried out. Anyone with information about what happened is asked to call the Major Investigation Team by dialling Suffolk Police on 101.